Have you heard the news? The lottery is up to a crazy amount of money tonight. Something like $1,400,000,000. That’s a heck of a lot of zeros behind that $1,4. It’s so much money, it’s almost scary. My hubby and I are not gamblers and we are not regular lottery players. Nothing against those that are, but we’ve always felt spending our money on a sure thing (like paying for child care or food) was a better use for us. However, with the lottery payout at this insane amount, we decided to buy a couple tickets – $10 worth (yeah, we’re so not gamblers). We are well aware the odds of us actually winning the lottery are very, very slim, but for that $10 we’ve had several hours of dreaming of what would we do with all that money. It was kind of nice to talk about our dreams. My son wants a dinner out and a car (he’s almost 16). My daughter wants her own personal barista to bring her Frappucinos and smoothies whenever she wants (she’s not driving yet, so they need to deliver). The hubby’s list is pretty much what you’d expect: sports cars and a vacation home. My list isn’t that long: fix those things around the house that drive me nuts and traveling the world. I might even spring for business class airplane seats so I don’t have to be squeezed in the coach class. 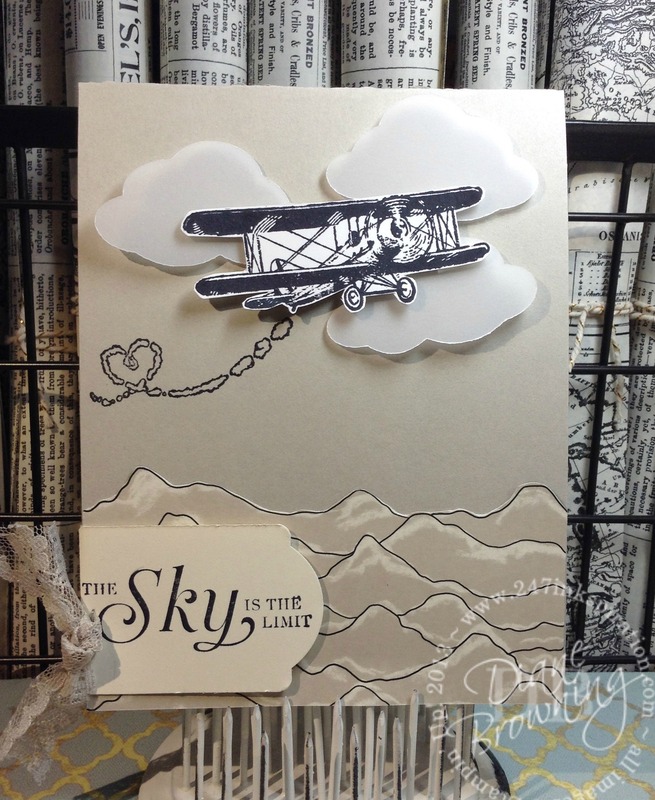 Dreaming of plane rides, as soon as I saw the Sky Is The Limit stamp set in the Sale-A-bration catalog, I knew I had to get it. If it’s travel-related, I must own it. It was free with a $50 purchase. This stamp set is available only until February 15th. Do you see how my vellum clouds look like they are floating? That’s done with some well-placed dimensionals. I put the dimensionals on the plane, then added the vellum clouds around the plane, and then added one more layer of dimensionals in the exact same spot under the vellum. To give more stability I have two more dimensionals in the center of the plane stacked on top of each other to give the added height needed. And now plane looks like it’s soaring through the clouds above the mountains! I love how that card turned out, but I really wanted something with more color. One of the colors used in the Going Places Designer Series Paper is Delightful Dijon. I’m not a fan of this color. I love my Hello Honey and Crushed Curry, but the Delightful Dijon is a little too dark for my taste. I decided that since I’ve used almost none of my Delightful Dijon paper that now was my chance to play with it a little. Rather than making the plane the focal point of this card, I used the image repeatedly to make a background. When you win a billion, the sky truly is the limit! So, if I do with the lottery tonight, I’ll have to come up with some sort of traveling stamp kit so I can keep up with my crafting from the road. Be sure to check back on Friday for my post to see if we won or not. I’ll either be talking about my traveling stamp kit or something else entirely. Both are good.